Up till now, there were no photos of burials at sea done aboard Mackay Bennett when it recovered Titanic victims. Victims who could be identified were brought back for burial by relatives. Those that could not be identified or third class who could not afford a funeral were buried at sea. Now Henry Aldridge and Son, who seem to have a franchise on Titanic memorabilia and rare antiques, have a photo up for auction that shows a mass funeral taking place. 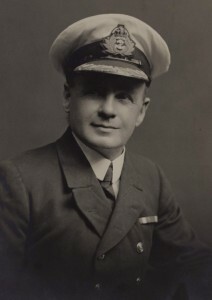 The photo was taken by Westy Legate, fourth officer of the ship. The photo shows body bags on the ship’s deck, two men appearing to tip a stretcher that carries a body into the sea, the ship’s priest Reverend Hind conducting a service, and members of the crew standing nearby. What myth is he referring to here? Most of the accounts I have read (and admittedly I have not read them all) generally relay it was a mass burial. Now perhaps to console grieving relatives not all details were included (like stacking bodies on the decks) but that is hardly a myth. It is hardly surprising that they would need to stack bodies on the deck, considering the numbers involved. Since it was a burial at sea, this would be a necessity. When I was a little kid and we came home from school, we turned on the television to watch our two favorites shows: The Lone Ranger and Superman. Batman too (the television series starring Adam West). Over the years I have never lost my affection for the Ranger show. And recently when Cozi, an over the air broadcast station, began operating in the San Francisco Bay Area, it began showing The Lone Ranger along with a lot of older classic television shows. And amazingly that show still holds an appeal today and many can easily identify its distinctive musical theme. The Lone Ranger originated as a popular radio show that successfully made the transition to television. It ran from 1949-1957 on ABC and was one of the most watched shows on the network. For most of the series, Clayton Moore played the titular character while Jay Silverheels played Tonto. However due to dispute either over wages (the studio claim) or creative differences (Moore’s claim), John Hart played the role from 1952-1953(52 episodes). However Hart was never accepted by fans and Moore was brought back. He stayed with the series till its end. Two theatrical movies were produced with this cast: The Lone Ranger (1956) and The Lone Ranger and the Lost City of Gold (1958). The show followed the basic story of the radio version. A group of Texas Rangers is pursuing the Cavindish Gang when they are betrayed by their guide, ambushed, and left for dead. Tonto comes along and finds one still alive. Tonto recognizes him from his childhood and nurses him back to health. In the radio version his name is John Reid though on television it is not mentioned (except by last name by an old friend who mines the silver) although the fake grave marker does list a name. Since his brother was killed in the ambush, he decides to track down the gang and bring them to justice. However he decides to hide his face so that no one knows he is alive (and presumably to protect family and friends who know him). Tonto accompanies him on his mission calling him Kemo Sabe. He acquires a white horse named Silver and uses silver bullets as his unique calling card. After tracking down the Cavindish Gang and its leader, he continues the mission to track and capture outlaws to make the West safe for people to settle and live in. Since he is masked all the time, the Ranger often runs into many who doubt him at first. However because his actions are always on the side of the law (even when using a disguise) he ultimately wins their trust. Unlike a vigilante who might track down and impose arbitrary punishment, the Ranger preferred capturing criminals and turning them over to the law for punishment. It would be foolish to mistake this as softness. The Ranger was a crack shot who shot to disarm first, kill only as a last resort. Sometimes the criminal might do something that led to their death. Often characters did die on the show, sometimes killed by the outlaw. Criminals came in all varieties from rustlers, gangs that robbed banks or swindlers, or sometimes clever gangs run by lawyers, ranchers, or important townspeople. The Ranger often helped unmask or uncover the true conspirators behind the schemes. Tonto, his faithful companion, provided important support. An expert tracker, he could also go into towns and learn things as people would rarely suspect him of anything (though he did face hostility at times). He aided the Ranger in apprehending the criminals, sometimes getting captured before revealing important information to Kemo Sabe. The Ranger trusted Tonto implicitly and never questioned his judgment. Sometimes he often pointed out things that Ranger did not know. Occasionally his nephew Dan Reid would join them for a while (usually between college;this was also part of the radio series as well). Music for both the radio and television versions came from classical sources. The famous Lone Ranger theme comes from the finale of Gioachino Rossini’s opera Guillaume Tell (William Tell). The theme would become so associated with Lone Ranger that mentioning the show invariably makes one think of that music. In many ways a tribute to Rossini. If you pay attention, you sometimes hear other classical themes as well like Ride of the Valkyries by Richard Wagner. The Lone Ranger never drinks or smokes (on television they made sure what obviously would be saloons and bartenders were shown as cafes that served food). When the series ended, both Clayton Moore and Jay Silverheels would spend (aside from acting) time in numerous public appearances, guest spots on shows, and commercials. And he would always appear as The Lone Ranger (and would never drink or smoke in public either). But in 1979 Jack Wrather, who owned the Ranger character, decided to make a new film version. It began a sad spectacle of having to force Clayton Moore to stop wearing the mask because it would undercut the value of the new version. And also they did not want people confused that Moore, then 65, would be getting back in the saddle again. Wrather obtained a court order that forced Moore to take off the mask, which he did, and then wore a brand of wrap-around sunglasses that nearly gave the same effect. 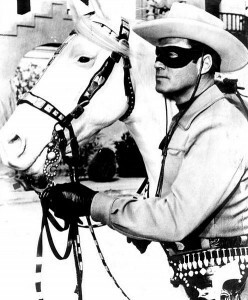 For many who watched the old show, Clayton Moore was The Lone Ranger. No substitutes needed! His star on the Hollywood Walk of Fame reads Clayton Moore–The Lone Ranger, which indicates how identified with the character he had become. The 1981 movie, The Legend of the Lone Ranger, was a complete bust at the box office. It is a terrible movie and the lead actor is totally forgotten now. You can look up the details and IMDB. Clayton Moore countersued Wrather and ultimately won allowing him to put the mask back on. Moore continued to do public appearances and even was associated with the baseball team Texas Rangers. Moore passed away in 1999 from a heart attack. Jay Silverheels passed away in 1979. Attempts at reviving the Ranger franchise have not been promising. The 1981 movie was a flop, an attempted WB show got such negative reviews it never went into development. The most recent Ranger movie, The Lone Ranger (2013) with Johnny Depp as Tonto and Armie Hammer as Ranger also failed at the box office. It generated mostly negative reviews from critics and movie goers. Metacritic.com gave it an overall rating of 37 out of 100 based on critic and user reviews. So what has gone wrong? A combination of things from poor scripts to rebranding The Lone Ranger into something different from the original series. If you remake a series, and make it totally different from a previous version you have to make it both hearken back and yet be something different. You can reimagine like what was done with Battlestar Galactica and create wholly different series that was successful. Star Trek took a darker tone with Deep Space Nine. It was a very different show than other Trek shows yet managed to fit in the Trek universe. Sometimes though it just does not work out. They tried Buck Rogers (based on a successful comic and movie series) and it was marginally okay until they totally rebranded in the second season (and then was quickly cancelled). Zorro returned as a successful series in 1990 (following the basic story from books and the previous Disney series) and did well. In that case, the writers kept the essential story and updated it with different actors. Perhaps it is The Lone Ranger was something that really needs little updating in terms of its basic premise. Sure you can make movies that flesh out more of the character or better portray his take down of the Cavindish gang, fooling around with the basic premise and mashing up who both Ranger and Tonto were tends to turn people off. They want to see the Ranger do what he does best: track down criminals to restore law and order to the old West. He was not someone conflicted about who he was or having to use a gun. He was about supporting the law, not acting as a vigilante. The show was not afraid to show that bad men do bad things (like killing people) and it did not glamorize them either. There was a clear distinction between good and bad people. And yet sometimes a bad person in the past could also become a good one in the present, something the Ranger believed in (and showed on numerous occasions). The Ranger was an optimist who believed what the country stood for and that good people could stand up against bad people and win. It might not be easy, and sometimes came at a price, but in the end the bad guy was brought to heel. MasterChef Junior: Are These Kids Really Kids? Update 28 Sep: The Friday television ratings are out.TV By The Numbers at zap2it.com reports the premiere of MasterChef Junior was number 1 at the 8:00 p.m. hour beating out the premiere of Undercover Boss, Last Man Standing (a show I liked until they fiddled with it and changed a cast member), Michael J. Fox Show, and Perfect Score. When I heard they were considering a kids version of MasterChef, I cringed. The success record of shows that try a junior version is not pretty. American Idol tried it and never did it again. We saw parents acting like divas, kids trying to be divas, and the American Idol judges trying to be serious about judging young children singing the hits. It was a mess. And The Amazing Race tried a family-friendly season. Except it turned out those families could be just as competitive and sometimes just as nasty as some in the regular season. And so it it appears MasterChef’s turn to go the kid route. I ask myself why. Like Del Shannon’s Runaway, I keep hearing why, why, why in my head. From what I learned before the first episode aired, it was clear they were going to hold these kids to the same standards of the regular MasterChef. Which means these kids really have to know how to cook. This is not opening a can or using a box mix to make a cake here folks. Safety wise it means a full brigade of medics are right there to watch those kids should they cut themselves. And the judges, while mostly the same as in the regular series, have to hold back on the nastiness they might throw out in the regular show when something nasty is put in front of them. Fortunately most of the kids presentations in this preliminary round were all good with some surprising exceptional cooking. It made me realize that some of these kids are learning to cook very young considering the techniques we saw. One kid brought up an exceptional looking sushi dish that a trained sushi chef would nod approvingly at. Perhaps this demonstrates a major shift in our culture where so many kids are interested in cooking food as a possible career choice. The Food Network and other places have made chefs and cooking more popular. Actually it is good thing kids learn to cook food. It is something that will carry with them all their lives and possibly pass on to their children. MasterChef Junior is not a cooking school but a real competition. And it looks like the judges–Joe Bastianich, Graham Elliot, Gordon Ramsay–are going to demand high standards from these kids. They might not use the nasty looks or comments they would use with adults, they will still have to tell them when a dish is unacceptable. Or send a kid home when they are on the bottom. I did wonder when they were judging the dishes whether they were being totally honest at times. Then again when a dish did not quite meet expectations they did tell them what was wrong with it. They seemed very surprised by the quality of the dishes prepared. It will be interesting to see how this plays out over the entire season. Right now I am still not entirely convinced this was wise or needed by MasterChef. Clearly they must have done some research and found a market for this show. However judging from what I saw in the season opener, it looks promising. The Guardian is reporting that British Advertising Standards Authority has decided not to investigate the ad. “Although the ad would be distasteful to some, it was unlikely to cause serious or widespread offence or be generally seen as making light of the lives that were lost in the disaster,” said the ASA. Howard Nelson of Titanic Heritage Trust said he was deeply disappointed in the decision. The Guardian is reporting that UK Advertising Standards Authority(ASA) has received 110 complaints regarding a recent advert for Red Bull energy drink. One complaint is from the Titanic Heritage Trust. “”Red Bull is using a tragic event to promote and sell its products without care for the people that were lost,” states Howard Nelson who founded the trust. The advert features a crate containing Red Bull being raised for loading onto a ship. Phillip Littlejohn (a descendent of Titanic survivor Alexander James Littlejohn )states he wants the ad banned. Trying to get government to shut it down is not the way to go here. You shame them in public and get lots of people to send emails, letters, and even protest outside their offices about the ad. Getting government to shut down the ad smacks of something else, namely censorship. Free speech means just that: you can say dumb things and others have the exact same right to call you nuts for it. Red Bull did not make a patently false claim about their product. Much has been said of the use of their advertising slogan “Red Bull gives you wings” aspect. The cartoon Captain Smith scoffs at the need for wings on his ship. Yet we all know that wings in this sense is not avian wings, but more of the effects of Red Bull on your system. Energy drinks are supposed to lift you up and get you going. At the same time, when connected to Titanic and its well known story, it does seem to imply it might have an effect. What kind of an effect is never stated. Now if a advert for a helicopter were used to show how they could have saved more lives in 1912, that would make sense (although implausible since that technology did not exist then). It is possible some are filling in what they think the ad is saying rather than what it is not. Does it insult the memory of Titanic? Consider the many Titanic themed t-shirts out there. Some, noted in this blog, have Titanic Swim Team or “Don’t Worry! There is plenty of water for all” emblazoned on them Now those I find more offensive since they trivialize a terrible event where people died. Red Bull’s strategy to use humor is always a risky move when it comes to historical events or people. For Red Bull it comes down to a simple answer: did it generate more or less sales? If the ad generated controversy and talk but flat sales, then expect the ad to end after its natural course and never be seen again. On the other hand, if people were amused rather than appalled, then perhaps more of these will be coming down the line. Imagine the possibilities. 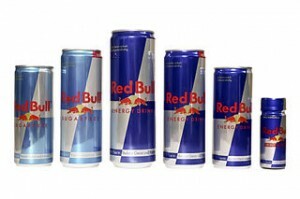 Julius Caesar offered Red Bull before his fateful encounter and laughing the need for wings. Or General Custer being offered a canteen of Red Bull before his infamous battle at Little Big Horn. Titanic II Update: Proof of concept testing for Titanic II has begun at Hamburg Ship Model Basin (HSVA) in Hamburg, Germany. The 9.3 meter model is being tested in a 300 meter tank in tests that include resistance and open water tests. “The Titanic II model was tested by HSVA at speeds of up to 23 knots and this testing is crucial for assessing the speed and power performance of this prototype vessel design,” said Clive Palmer. 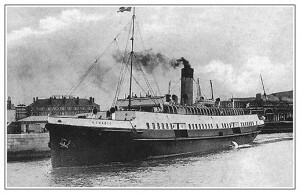 SS Nomadic Update: Ticket prices for Titanic’s tender SS Nomadic may have reduced admission prices for winter reports BBC News. Since SS Nomadic is a separate exhibit from Titanic Belfast, there has been some criticism that they are not connected in simple admission price. While no reduced price has been finalized, the long term goal is for joint ticketing with Titanic Belfast. A movie camera that possibly belonged to Titanic second officer Charles Lightoller was among 300 cameras that Roger Lott bought at a clearance for £300. When he brought the cameras back to his shop, he discovered an old movie camera with the name CH Lightoller on it. A friend told him it might be the Titanic second officer. Lott says he has an offer to buy the camera and the British Titanic Society is interested in looking at it. There is also still film in the camera which will require a specialist to handle and develop. 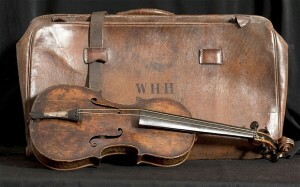 The violin Wallace Hartley had aboard Titanic is on display today at Titanic Belfast in the second-class accommodation suite until 13 October. This will be the last public showing of the violin as it is scheduled to be auctioned off on 19 October by auctioneers Henry Aldridge & Son. It is strongly advised you purchase admission tickets in advance.